Welcome to Rapidly Rotating Records, bringing you vintage music to which you can't *not* tap your toes, from rapidly rotating 78 RPM records of the 1920s and'30s. HAPPY NEW YEAR!! And THANK YOU!! In response to my plea last week to help get us over the 600 mark on Facebook, we're starting off the year with 604 Facebook fans of the show! THANK YOU for listening and for your support and encouragement through posts to the website and Facebook pages, email and memberships to KISL. On this very first Rapidly Rotating Records show of 2017, we'll celebrate the birthdays of Vincent Lopez, Jule Styne and Harry Smith. We'll also have a set of "forever" songs. But because nothing lasts forever, unfortunately we'll be celebrating the life and career of Rich Conaty who passed away last Friday. As most of you know, Rich was the host of "The Big "Broadcast" since 1973 on WFUV in New York. The Rapidly Rotating Records telephone request line is waiting for your call! In addition to sending cards or letters, sending email, or posting to the the show's website or facebook page, you can now call in to request a particular artist, song or topic segment, leave feedback about the show, or ask questions or comment about the music. Of course, I'd be happy if you just call in to say "Hi!" and let me know you're out there listening. Listen to the show for the easy-to-remember number. We're also proud and happy to now be rebroadcast over Global Community Radio! We're on GCR's music channel GRC-2 and can be heard on the University of Wisconsin's station WRST-FM 90.3 in Oshkosh at www.wrst.org Saturday mornings at 8 AM (Eastern). Wwe're also now heard on WXDR, 98.9, in New Orleans, Louisiana. WXDR, known on the air as Dolphin Radio, is the student station at Delgado Community College at 7:00 AM (Central). You can find out more about Global Community Radio at globalcommunityradio.blogspot.com. As always, just click on the link below to instantly listen streaming online and/or download the show. 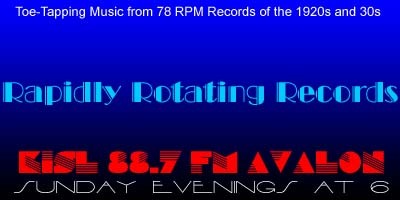 A number of records are making their RRR debut and your comments, topic suggestions and requests are always welcome. Let us know what your favorite record is by posting a comment to the website or to our Facebook page. Dear Eyes That Haunt Me – The Columbians / Lewis James, v.
Yours Is My Heart Alone – Leo Reisman AHO / Frank Munn, v.
Sunday – Abe Lyman's California Orchestra / Unidentified, v.
Just Love Me (That's All) – Charles Kaley Orchestra / Charles Kaley, v.
Are You Happy? – Vincent Lopez AHO / Franklyn Baur, v.
Silver Head – Polla's Clover Gardens Orchestra / Vernon Dalhart, v.
Pals Forever – Anson Weeks and His Hotel Mark Hopkins Orchestra / Unidentified, v.
Forever – Bar Harbor Society Orchestra / Irving Kaufman, v.
Forevermore – Jules Herbeveaux's Orchestra / Frank Sylvano, v.
You Meet The Nicest People In Your Dreams – Fats Waller and His Rhythm / Fats Waller, v.
Great Day – Paul Whiteman AHO / Bing Crosby, Jack Fulton, Harry Barris, Al Rinker, v.